NextCopy of Patented Fitting System SALE!!! To April 15th! Save 10% PROMO: CREATE! Also, included FIT MADE EASY! …tips & tricks, & fitting solutions! Created by designers, for designers. Everything you need to shape your dress form. or even change sizes! 17 Contoured pads and (2) body covers (w/ industry princess seams) included! Choose the size of your Fitting System to match your target measurements. To help you decide on your size and style, we’ve included our sizing chart, how-to’s, and measuring guide below. Fashion design can become frustrating/daunting from the natural variation in body shapes. Many women wear the same size clothing, yet their bodies are shaped so differently! We’re glad to say that you can now avoid tensions and ill-fitting clothing with our Fitting System. Each Fabulous Fit dress form comes with padding that allows you to add 1 to 3 inches in various areas on your dress form…and…the Fabulous Fit Fitting® System can be used with any dress form style, from any dress form manufacturer, to shape, or change sizes! Need more inches? Layer up! 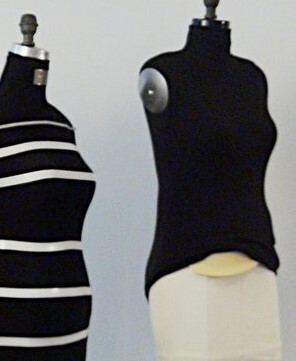 Our Regular Fitting System comes with your choice of a black or natural cover that extends to the mannequin’s hip. Included with each Fabulous Fit® dress form system are 17 contoured pads, 1 side seam cover, and 1 Princess seam cover. Our Full Body Fitting System includes your choice of a natural or black cover that extends from the mannequin’s neck to its ankles. This system comes with 17 contoured pads and 1 neck-to-ankle Princess cover with a back zipper. Our Fabulous Fit® Fitting System is known worldwide for accurately creating form-fitting dresses, pants, skirts, and shirts. Their lifelike touch and shape becomes the ultimate body form for any fitting. From Beyoncé to Hillary Clinton and every body in between...we proudly guarantee that Fabulous Fit works! In the steps below, you’ll find out more about how much of an impact our Fitting System will have on your projects. Our exclusive system effortlessly translates your design ideas into a fun, easy, and comfortable creation. Just shape your dress form to match the pressure points (areas where you move) on your dress form! You'll be able to see how your form-fitting dresses, altered pants, or from-scratch gown will look and feel before you ever try them on! No more fittings… our system makes fashion design so easy! Bump Up ANY area on your dress form! Extra Pads or Cover...30% OFF! 3. TRY SOMETHING OF YOUR OWN ON THE DRESS FORM. Your clothes will be your best "Fitting Assistant". 10. Tuck the cover under at the bottom of the form. You’re now ready for easy, fabulous-fitting clothes! 10. Zip the cover up and you’re ready for fabulous fitting clothes! Fabulous Fit® Contoured Pads are Interchangeable for all Sizes! If you’ve ever wondered why a sleeve pulls, a seam puckers, or why your new clothes hang in the closet... Fabulous Fit will take your creativity and your comfort zone to the next level. We make it possible to wear your previously disregarded or ill-fitting clothing again! Our Fabulous Fit® Fitting System includes interchangeable life-like contoured pads and a cover (with industry grain lines) that allow women who wear the same size but are shaped differently to customize each area of the bosom, waist, hips, and thighs on a dress form. Now you can duplicate the shape of your model, mother, or client using only one mannequin! There’s nothing so accurate as seeing, touching, working, and pinning a "real body duplicate". Seeing exactly how your clothes will look and feel on a dress form gives every fitting a new dimension! The soft, lifelike pads slide next to the dress form under the stretch cover. As you stretch the cover over the form (or pull it up on the split leg form), tuck the pads under the cover at the vertical and horizontal measurements. Be sure to follow the included measurement chart and diagram. Then check the shape and measurement by trying a garment on the dress form. Continue to pad the next area, and repeat the process. Our contoured pads are pinnable for patternmaking, draping, sewing, and pressing. Position them under the dress form’s cover to duplicate nearly every area of the body. You can also duplicate and change multiple body shapes by either by changing the positions of each pad or adding more. With each Fitting System, you can change one dress form into three different sizes and infinite shapes. Enhance certain areas further or create a larger size with additional Fitting Systems. These pads bring a lifelike touch to your dress form, giving you something more natural to work with, steam on, and pin into. It’s easy to create longer or shorter torsos on our Standard Dress Form, Dress Form with Legs, or Studio Dress Form with Half Legs. We use a waist tape to determine the actual waist height for pants, which can be lowered or raised according to the body shape or pattern design. You can use a ribbon, twill tape, or markings. Raise or lower the pads…even with the cover on the dress form…to match the vertical curved position; from skirts at the waist to pants a little lower. Because our dress forms are molded from real-fit models, the natural crotch is perfect for fitting pants. To create a longer torso, simply raise the shoulders with the included padding or Filler Pads, or lengthen the body between the legs with a filler pad. For shorter waists and pants, lower your markings or your twill tape on the dress form. For waisted dresses, simply raise the twill tape. These adjustments can be made by raising or lowering the position of the pads on your dress form as you shape it to match your intended body type. When this is complete, position your mannequin’s waist at the new vertical measurement. Slope or round out shoulders by positioning the shoulder pads forward on the dress form. You can also create very straight or asymmetrical shoulders by properly positioning the pads. Bust lines can be duplicated (high, low, or fuller) by placing the bust pads in the vertical “up” or “down” position. To ensure accuracy, follow the measurement chart and placement diagram that’s included with each Fitting System. You can also erase the waist on your dress form to match your own shape with our contoured side back pads. Place them along the side of the form to straighten the hourglass shape, and add a stomach pad to tuck in the front. Our upper-hip pads also give you the width you need to properly fit waistbands. Complete every pressure point on your dress form to maximize movement with our thigh and back hip pads. Really…You Don’t Even Have to Try It On! Check your measurements from the chart below and measure the points where your fabric will fall. Be honest. There are only three measurements that you’ll need: The bust, the waist, and the hip. Within this range, you’ll be able to create all the other "in-between" measurements as long as the form is one to three inches smaller than the body you’re working on. Fitting Systems, or individual pads, can also be layered for additional measurements. See below. NEED EXTRA PADS AND COVERS? Layer your dress form for larger sizes!!! 30% Discount! Each Fabulous Fit Fitting System will increase the measurements of the dress 1 to 3 inches. Use your finished measurements to choose the correct system for your project. Get FREE Articles & Coupons!